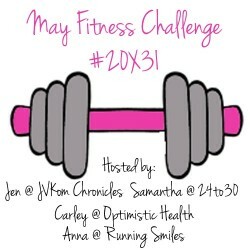 This entry was posted in Uncategorized and tagged #20x31, Blogging U, exercise, fitness, May fitness challenge, Writing 101, yoga by Sarah Day. Bookmark the permalink. Thanks so much for linking up this month! I’m so glad you were more aware this month! Thanks to you! Looking forward to your June challenge.